What Does the ECO Driving Indicator Light Mean? The ECO driving indicator light turns on when your car is driving at a speed that allows you to get the maximum miles from a gallon of gas. Advancements with computer controlled engines have led to higher miles per gallon (MPG), but there’s one thing auto manufacturer’s can’t prevent or control — drivers who accelerate heavily. Pushing the gas pedal all the way to the floor, consumes a lot of fuel. The ECO driving indicator lights have been around since the mid 2000’s. This ECO light serves to let drivers know if they are getting the most out of their fuel tank. Depending on the type of vehicle, in the ECO mode, the throttle responsiveness, transmission gear shifting, or the electric systems will be tuned to reduce their energy draw. You can refer to the owner’s manual for specific information on what your ECO light means. On an average, if the ECO light is on, the computer is letting you know that the engine is operating close to it’s maximum miles per gallon. The computer monitors parameters like the speed of the vehicle, engine RPM, and throttle position to decide when to turn on the ECO indicator light. On some vehicles, when the ECO light goes on, some aspects of the engine, such as ignition timing or fuel usage can change slightly in order to increase the efficiency. Some cars, such as newer Honda Accords, use a technique called cylinder cancellation to reduce fuel consumption. The ECO light will illuminate to let the driver know that some of the cylinders have been disabled. This is completely normal and is ideal for keeping your gas tank full. However, the ECO light isn’t used as a warning indicator as the check engine light is similarly focused on emissions. If the check engine light is on, your ECO light may never illuminate due to reduced engine efficiency. Is it safe to drive with the ECO driving indicator light on? As a matter of fact, it is recommended that you drive with the light on. Reducing fuel consumption is good for the environment and good for keeping money in your pocket. It is not recommended that you drive with the ECO light on all the time. Although it may be tempting to try and keep your engine running as efficiently as possible, there are times when you should step on the pedal like situations when you are trying to merge onto a fast moving street or highway. Merging onto a 60 MPH highway when you’re only going 40 could spell disaster. All it takes is one distracted driver who does not notice your reduced speed! 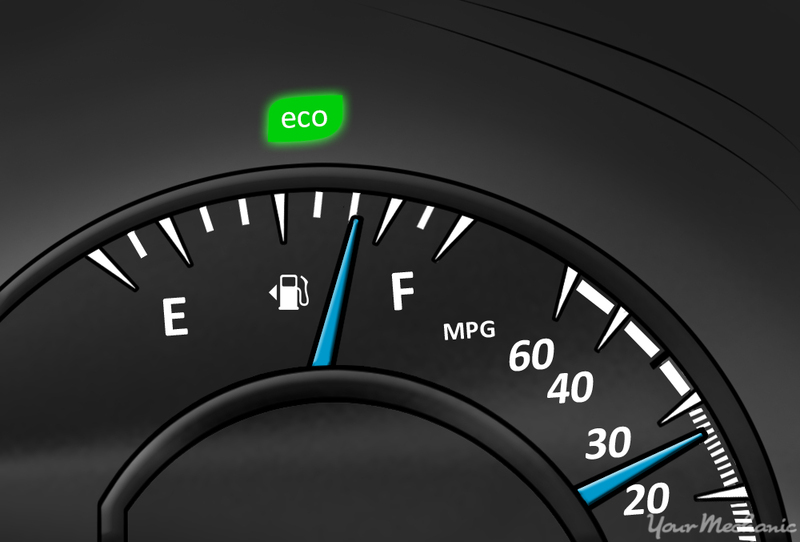 Once you’ve accelerated to the flow of traffic, then you can return to ECO mode and enjoy the MPG’s. Your engine will not hate you for having the ECO light go off every now and then. If your ECO light doesn’t appear to be working normally, one of our certified technicians would be able to assist you in diagnosing any problems.